Let’s face it, if you have children, you’re busy. If you have a child with hearing loss, you’re even busier. Fitting in weekly home visits or center-based appointments with your child’s listening and spoken language (LSL) interventionist or driving your child to and from preschool, your daily schedule is likely bursting at the seams. Meanwhile, you’re probably spending some extra time maintaining a language rich environment for your child with hearing loss. If you’re feeling guilty that you’re not spending enough time with your entire family, don’t be so hard on yourself. Whether you’re managing your household, taking time to sit down to dinner together or juggling work and the schedules of all your children, as parents we all strive to find family balance. Achieving a successful LSL outcome for your child with hearing loss does require an increased commitment of time and resources. 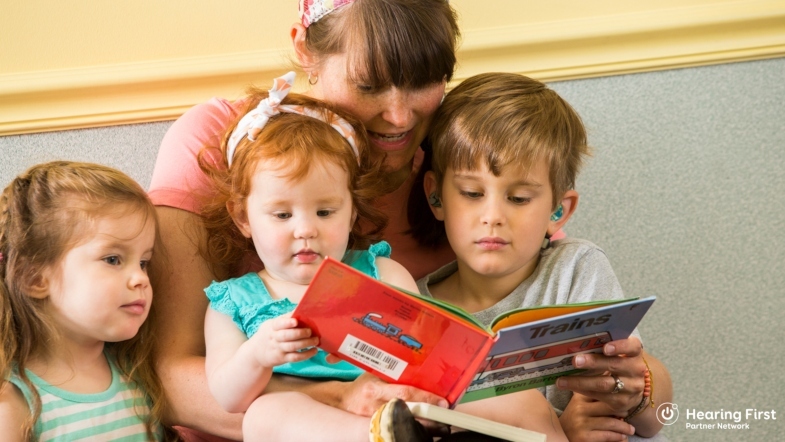 Keeping the hearing technology on and working so your child has auditory access all the time and attending all intervention sessions can be a challenge. Plus, your child’s siblings may feel pressure with the additional schedule demands of participating in intervention sessions or waiting during audiology appointments. And, siblings may feel left out or resentful that you’re providing too much attention to their sibling with hearing loss. It’s important to acknowledge siblings’ emotional needs as well and strive to provide a balanced approach to your whole family structure. Use a family calendar. Use a shared calendar for family members who are supporting your efforts. There are free phone apps that allow family members to keep up with all your family's activities. You can assign who is doing what, send reminders and keep notes. You can even send invites to others so they can help navigate busy schedules. If you have multiple children, plan one-on-one time with each child. This time together could be as simple as going to the grocery store, running errands or visiting the library. Involve grandparents and extended family. Ask a close friend or relative to occasionally take your child to an LSL intervention session so that you can take another child to an appointment, sporting event or school field trip. Plan time to rest. Consider your options for others to watch your child so you have time alone to rest and relax. Involve your significant other or extended family in decision making. This alone ensures you have support. Communicate life changes with your audiologist and/or LSL interventionist. Understanding your need to make short-term schedule changes will be much easier if your professional is in the loop. Connect with other parents of children who are deaf or hard of hearing who understand what you’re going through. Their support, knowledge and encouragement can give you the hope and inspiration you need to KEEP GOING! Make the most out of travel time. Download the LSL Day by Day Travel Talk handout. Embed language activities into what you’re already doing all day, every day in your regular family routines. You’re not changing your schedule or routines, you’re changing how you think and talk about what happens during each routine. Prepare meals together as a family. Narrate the actions and involve your child. This provides a big opportunity for practicing LSL skills. Divide household responsibilities between parents or older siblings. Share your needs with your LSL interventionist so they can help you find resources such as transportation options, health and nutrition assistance or respite services. Consider other options for LSL intervention. Tele-intervention (using the internet and/or computer technology to connect with a qualified professional) may be available to you to minimize stress and travel to and from intervention. Above all, enjoy your family and have fun! Blog post originally appeared on the Hearing First blog, Finding Family Balance in LSL Life.